On Easter Wednesday—the 50th anniversary of MLK’s assassination—our mentor and “mother of the movement” Liz McAlister, along with six Catholic Worker veterans, entered the Trident nuclear submarine base in Kings Bay, GA in order to begin the disarmament process. Learn more about this action at www.facebook.com/Kingsbayplowshares/. Who is this extraordinary woman? As the first of our bonus Bartcastsduring the Easter season we are featuring a 2-part interview with Liz by Elaine and Ched from June, 2013, during the 40th anniversary of Jonah House, her Christian peacemaking community in Baltimore, MD. (If you prefer the visuals, you can also see this interview as a recorded webinar for free here). Ched’s seminal work, Binding the Strong Man: A Political Reading of Mark’s Story of Jesus(Orbis, 1988) is 30 years old and still being widely used. BCM is celebrating with a special sale price of just $25, including domestic shipping in the US (contact us for a shipping quote outside the US). Our official BCM full-color poster is now available. 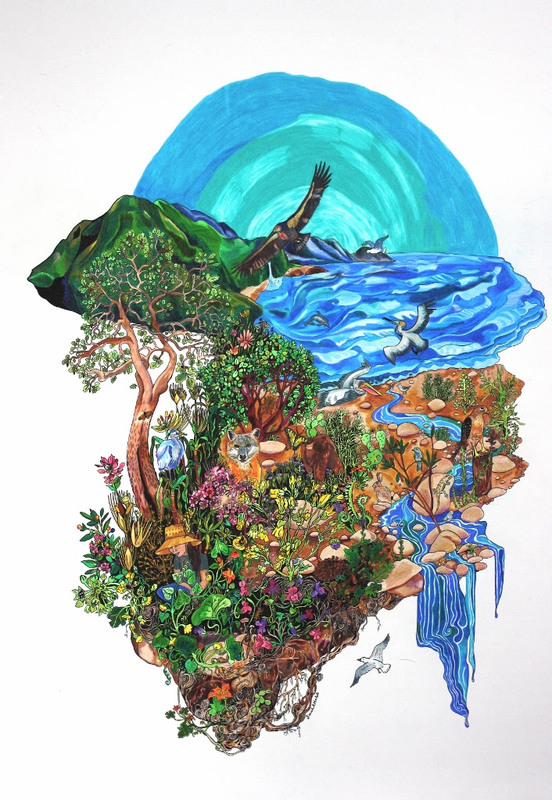 This beautiful artwork by friend Sarah Holst depicts the flora, fauna and friends of the Ventura River Watershed. It is available for purchase in limited quantities here. Check out the spring speaking schedule to catch Elaine and Ched around the country between April and September. Pray for our friends in jail in Georgia, and practice Resurrection!